In preparation for the NFH Gala Anniversary Night, which is scheduled to Begin on August 21ST–26TH 2018 at Lagos Nigeria, The Fashion company(NFH) has decided to host free Photoshoots in all state's in Nigeria. 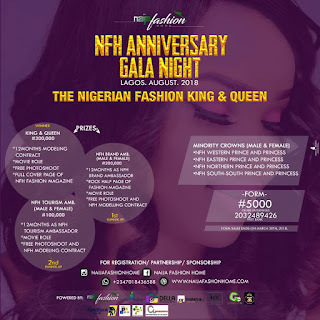 The Free Photoshoots slated to end on 31ST March 2018, same day the registration for the Nigerian Fashion king and Queen Is ending. Hurry up and get your forms if you want to compete with other contestants. See flyer below for more details. The concept of the photoshoot is tagged BOSSMAN/BOSSLADY. The Photoshoot has already begun in some states and about to begin in other states as well. For more enquiries call/Message +2347018436588. 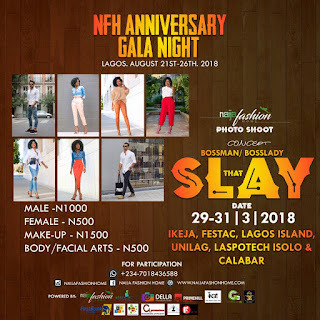 0 Response to "NFH Anniversary Gala Photoshoots( BOSSMAN/BOSSLADY)"